London, UK, 14 February 2018 – Chemical shipping freight rates will weaken through 2018 due to the depressed outlook on overtonnaged long haul routes, according to the latest edition of the Chemical Forecaster, published by global shipping consultancy Drewry. The global chemical trade grew by a little over 4% in 2017, while overall tonne-mile demand expanded by almost 5%. 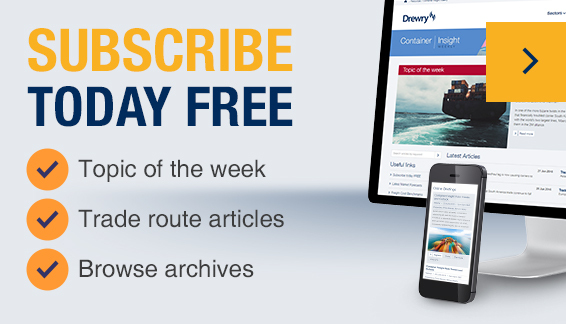 Despite continuing global economic growth, Drewry expects seaborne chemical trade to grow by 2.5% in 2018 and tonne-mile demand by 1.6%, reflecting a slowdown in long-haul trip growth. Increasing self-sufficiency in base chemicals in Asian countries is a definite threat to long-haul trades. The global chemical capable fleet increased by 3.9% in tonnage terms in 2017. However, the fleet trading in the chemicals/vegoils market expanded by 18%, while the fleet trading in CPP declined by 4% as the weakness in this market encouraged owners to switch trades. Some 200 IMO tankers aggregating 3.1 mdwt are scheduled to be delivered in 2018. Scrapping will continue to play a vital role and will increase until 2020 when the new Ballast Water Treatment System (BWTS) and the sulphur cap regulations come into effect. However, it will not be sufficient to offset new deliveries and Drewry forecast that the fleet is likely to grow by an annual rate of around 3% this year and next year. Drewry expect freight rates to weaken further through 2018 as newbuildings enter service. It is also the case that the future performance of the CPP market will continue to be an important factor in supply changes in the chemicals/vegoils sector. “We expect freight rates to remain stable in 2018 on major regional routes, but they will be depressed on traditional long-haul routes because of oversupply of large vessels,” commented Hu Qing, Drewry’s lead analyst for chemical shipping. “We forecast oversupply in the chemical sector in 2018. The fleet trading in chemicals has expanded more than demand and will continue to so in 2018. Apart from the fact that deliveries of new ships will outpace scrapping, it is also the case that the average size of the new vessels scheduled for delivery are larger than the vessels they are replacing. We therefore expect time charter rates to come under increasing pressure,” added Qing.